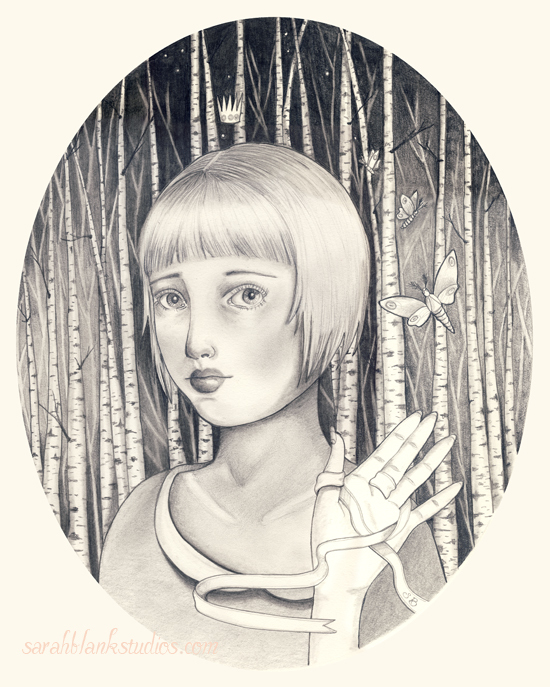 But first I would like to say that I just put a larger, ORIGINAL drawing (11″ by 14″) of “From Within” in my shop. I’ve been thinking about wildflowers and all things green and lush (yes, very unfall-like of me). 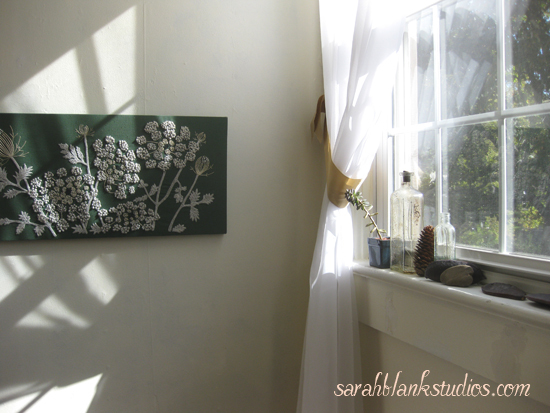 I pulled out one of my favorite found embroideries and hung it on my wall. I’ve been thinking about it ever since I received this package. 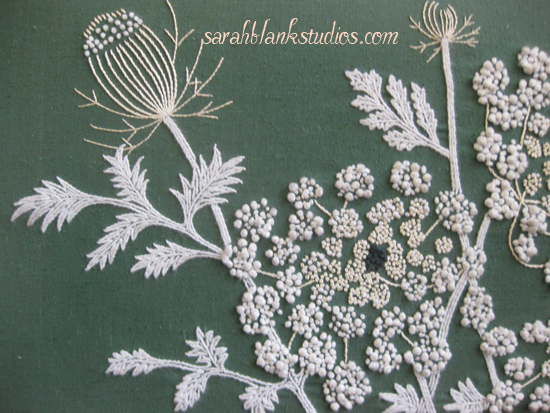 I took photos of the queen annes lace embroidery and posted them here last year, but I just love it so much, so here’s more! And knowing that winter will soon be here I have been adorning my windwsill with this and that, summer memories and other things, found. The sandy bottle was a wash up at the beach. It’s very old! The other, smaller bottle I found in the early spring during a walk through the woods. 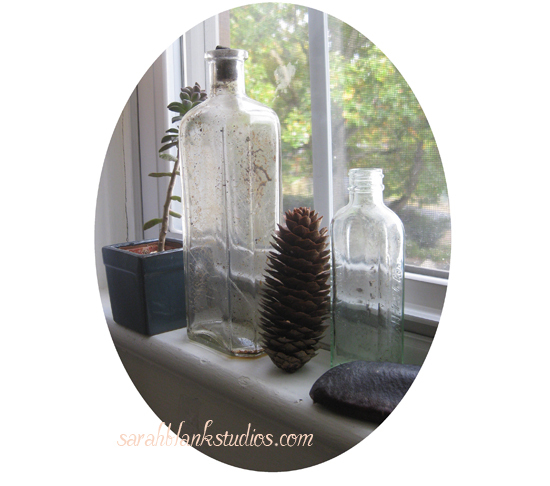 Did you know that the frost pushes old bottle and other discarded items up out of the ground in the spring? I have been painting too. This is a piece in the earliest of stages…just the underpainting and I’m sure it will change and morph into something totally different. But the concept will stay the same for the most part. The raw umber scribbles you see in the right hand corner are actually a grove of willow trees with a piano in the middle. I imagined a procession of birds soaring out of it. The leaves were in their glory over the weekend! They are now falling. 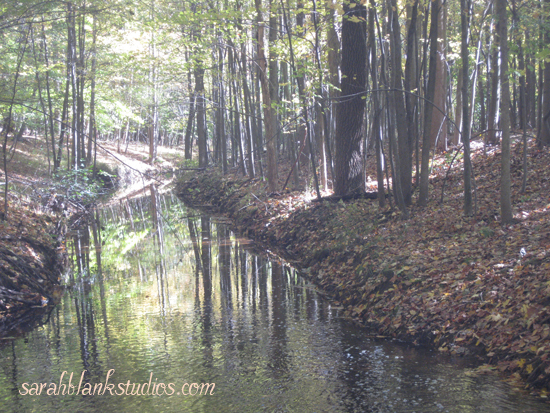 To everyone in the northern hemisphere, enjoy the remainder of autumn bliss ! I decided to add the levitating crown from the original sketch. I have been inspired by this painting by Albrecht Durer, moths instead of the angels. Originally I was going to have the moths hold up the crown, but then I put them over to the side, as if they were released from her ribboned hand. I had another idea for the treatment of birch trees that I wanted to try. It’s a bit softer. I am still stuck on which one I like more. And yes, I did the whole thing over, again. 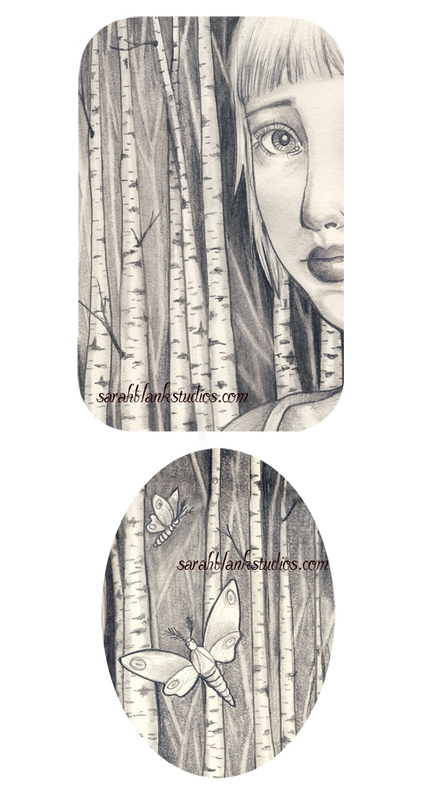 I was thinking about just drawing the new background of birch trees and digitally putting the girl in the foreground, but I must have original hard copies of my work. It’s one of those obsessive things that I suffer from. Thanks so much for all your kind comments about my drawing in the previous post! 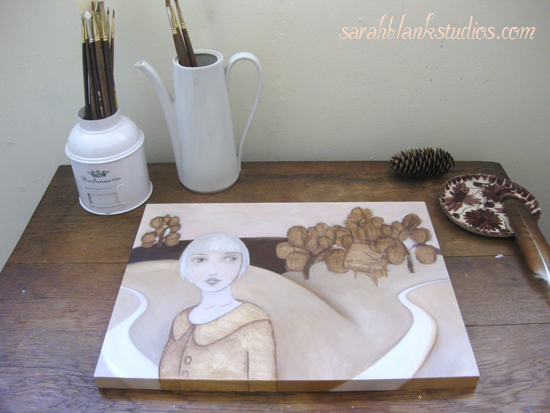 Perhaps I’ll make a painting from her or somehow integrate her into a larger painting. There will be a print of this drawing in my shop, very soon.